Year 1 - Happy Easter! This half term has simply flown by and here we are – at the end of our second term together in Year 1. The children have stayed focused on their learning this week, as well as enjoying events such as the spring concert and a very entertaining Easter assembly, run by Mrs Laver. We have finished our ‘chick’ art project – the children were so proud of their work. They worked very hard in each of the sessions to independently create their chick and making it the best that they could. The finishing touches were added on Thursday, along with a ‘birth certificate’ for each one. In maths, we have been working on using non-standard units to measure length and height. We had great fun drawing around a partner and seeing how many straws, felt tips and Dienes high they were! We also worked on thinking about how long some tasks might take (a clap, writing a sentence, watching a film), and sorting them into hours, minutes and seconds. We also compared time (hours, minutes and seconds), and asked questions like, ‘Is ten seconds longer or shorter than one minute?’. To end the week, we have been exploring turns (quarter, half and three-quarters), and used our knowledge to give ‘robot’ instructions to a partner. We also looked at turning ‘tiles’ into patters and describing the turns that we made. Many of the children found this quite tricky, so if you are able to have a go at home, that would be great! We have finished our ‘Oi Frog’ poetry and enjoyed sharing it with the children in Year R. Our poems have made a super display outside Juniper Class, which many children have stopped to look at and read the poetry. Fantastic work, Year 1! In RE, we have been continuing our learning of Remembering- sad then happy, by learning about the Easter Story. After listening to the story, the children created a timeline of the events of Easter week, identifying when those involved would have been sad and then happy. We thought about the messages that the story gives us today, and the importance of Easter to Christians. The children loved performing at the Recorder concert on Tuesday; very many thanks for being a wonderful audience! Next term, we will be learning to play … that’s a surprise for after the holidays! We continue with our phonics and guided reading daily. Many of the children have moved book bands this week – congratulations to you all! We hope that you keep reading and enjoying books over the holiday. Next half term, our topic will be ‘When I grow up’. As part of the topic, we will need each child to have a named, empty, clean and dry 2l soft drinks bottle with the original label removed (lid needed too!). Please bring these in after the holidays. We will also be thinking about the different jobs that people do. A letter will shortly be coming out to request parent/carers/family members to come into the classroom and talk to the children about their job. This only has to be for approx. 20 minutes or so, and if possible, we would like to hear information such as what you do, if you need any special equipment/skills/training/clothes and the best thing about your job. Very many thanks in advance if you are able to help! We would like to wish everyone a lovely, relaxing Easter break! Year 1 - Chick-loads of fun! The penultimate week of the term draws to a close, and the children have had a feathery ending! 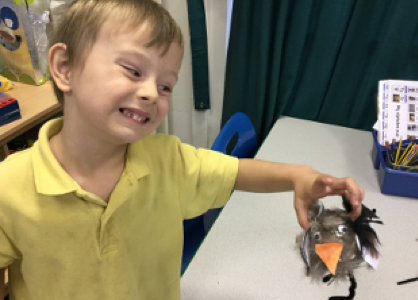 Juniper and Maple had a wonderful time this afternoon creating their feathered friends, which they will be bringing proudly home in time for Easter! In maths this week, we have enjoyed learning about 3D shapes. 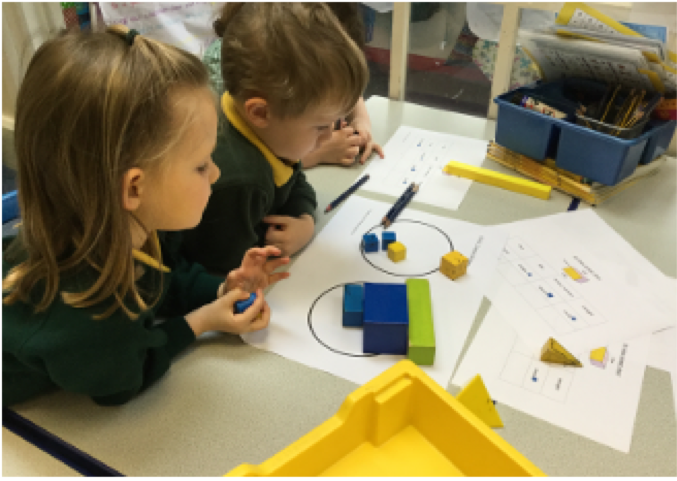 We have worked on identifying and naming 3D shapes, exploring their properties and working out how we could sort them, justifying our reasoning. Next week, we will be moving onto measure, using non-standard units to measure height and length, as well as exploring seconds, minutes and hours. We will end our unit of measure by learning about turns and using our knowledge to explore the school grounds! We have now planned and written our animal poems, which we will be publishing on Monday. We look forward to performing them to Year R later in the week! The children have worked extremely hard on including plural nouns and prepositions in their work – we await the final results! In RE, we have started to think about the Easter message, and exploring sad and happy feelings. We have shared a lovely book, ‘Badger’s Parting Gifts’, by Susan Varley, which stimulated conversations about when we have been sad and then happy. Next week, we look forward to hearing the Easter story and learning about it in more detail. The children have been busy practicing for their recorder concert on Tuesday 2ndApril in the school hall. Year 1 will be performing from 2.20pm – 2.40pm approx.., and Year 2 from 2.40pm – 3.00pm approx.. The gate by the school office will be open from 2.15pm. We look forward to welcoming you. As always, we enjoy our phonics and reading daily. Recorder concert: Tuesday 2nd April in the school hall. Year 1 will be performing from 2.20pm – 2.40pm approx.., and Year 2 from 2.40pm – 3.00pm approx.. The gate by the school office will be open from 2.15pm. Home learning: Due on Monday 1st April please. Thank you to those who have already returned theirs. When I grow up topic: For this topic, each child will need a clean, dry 2l plastic soft drinks bottle with the top on and label removed (labelled with your child’s name). To be bought into school after Easter please. Thank you! PE kits: These will be sent home this week for the holiday. Please could you check that your child’s plimsolls/trainers still fit, as several children say that theirs are too small. Many thanks. Year 1 having cricketing fun. Year 1 - our children become authors! We have reached the halfway point in the year – a term and a half completed and a term and half to go! The children have worked extremely hard in their learning this week and have produced some excellent pieces of work. We are very proud of their achievements! In maths, we have been exploring 2D shapes. After naming a range of 2D shapes, we learnt about their properties, using the language of ‘edges’ and ‘vertices’ to describe them. The children made Mr Men ‘ID badges’ for the different shaped characters, and played games of shape ‘odd one out’. We also used hoops to sort shapes according to different criteria. Some children drew their own Venn diagrams to help them to explain their thinking. In English, the children planned and wrote their instructions for making a fruit kebab. They published their work into bordered paper and used them to ‘teach’ their parents/carers when they visited the classroom on Thursday for our ‘Go Bananas! outcome. They also write a mini questionnaire which they used at the end of the afternoon to evaluate their work. We were amazed by the quality of the writing, sentence structure and presentation – well done Year 1! Many thanks to everyone who supported our outcome on Thursday, we had a wonderful time! Our beans have grown beautifully and we have been able to have a close look at the different parts of the plant in our science lessons. We have been investigating the life cycle of a bean plan, drawing and labelling our own version today. Some of the children were able to write an explanation of how the bean was growing at each stage. In PSHE, we have been thinking about making choices and their consequences. We thought about good and not so good choices, and how they might make us feel. Over half term, the coloured band boxes will be topped up with some new readers which were purchased by FOS. Thank you to FOS – I know that the children will love having some exciting new books to read! We will be returning to our Wednesday and Friday PE slots next half term. Please ensure that your child has a PE kit (clearly labelled) that fits in school on these days. We continue with recorder lessons on Tuesdays. Have a wonderful half term! Thank you for your continued support. Year 1 - Fruit-tastic fun!